WELLINGTON, New Zealand, February 12, 2017 (ENS) – Hundreds of pilot whales stranded and died on the northern tip of New Zealand’s South Island this weekend; others in that group were refloated, but then hundreds more beached themselves Saturday. In the third largest recorded whale stranding in New Zealand since data collection began in the 1800s, more than 415 pilot whales stranded on the beach near the base of Farewell Spit late Thursday night. Close to 300 of the stranded whales were already dead when they were discovered by a Department of Conservation staffer early Friday morning. A refloat of more than 100 whales took place on the Friday morning high tide. 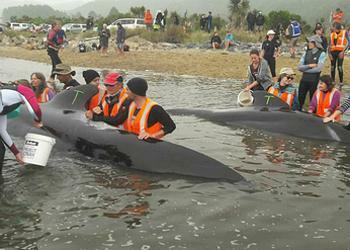 The refloat was partly successful with around 50 whales swimming out into Golden Bay. The remaining 80 to 90 whales restranded on the beach. Twenty of those restranded whales had to be euthanized. DOC staffers said the agency took the decision to humanely euthanize the whales out of concern for their welfare. 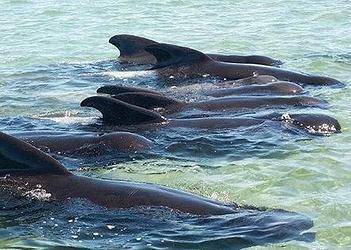 The others appeared to be safe but in spite of best efforts by everyone to prevent further losses, a large pod of approximately 200 pilot whales that were free-swimming, have stranded near the original site and DOC and the volunteer whale rescue group Project Jonah called for more volunteers. Volunteers and DOC staffers kept the beached whales as comfortable as possible until dark by pouring water over them to lower body temperatures. The DOC warns that it is unsafe for people to be close to the whales in the dark. Whales can become agitated when stressed and can injure or even kill a human with a small flick of a whale fin or tail. They also carry diseases so people need to avoid contact with blowhole exhalent or body fluids. About 240 whales from a different pod stranded themselves between Puponga and Pakawau late on Saturday. Most of these whales refloated themselves on last night’s high tide at 11 pm and milled around in shallow water before swimming off in a easterly direction off Collingwood. Seventeen pilot whales that were part of that larger pod stranded Saturday near Puponga have been successfully turned around on the high tide and sent back into deeper water in Golden Bay. Two boats were used to guide the 17 whales out to rejoin the original diffuse pod and everyone concerned hopes they will find a way into safer waters. Whale experts with the DOC explain that not all stranded whales can successfully be refloated. Even when some whales are saved, they may still restrand as has happened in this instance and prolongs the effort and reduces the chances of success. No more whales stranded in Golden Bay today, according to the DOC. The pilot whales that were in the area Saturday were last seen late Saturday night about six kilometres offshore, swimming towards Separation Point at the northern end of Abel Tasman National Park. Over 500 volunteers turned out to assist with the rescue effort. Andrew Lamason, operations manager Takaka, acknowledged the great work done by whale rescue nonprofit group Project Jonah. “Project Jonah has been doing a fantastic job organizing the volunteers, providing instruction and safety briefings, and even managing the carparking issues,” said Lamason. DOC has arranged with Massey University to undertake a necropsy of some of the dead whales. Department of Conservation has reconsidered its plans for disposal of the dead whales from the strandings on Farewell Spit. 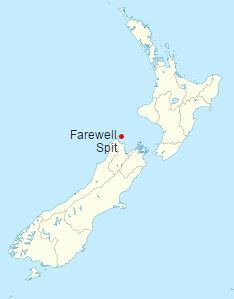 The dead whales will now be moved with a digger further up Farewell Spit to the area of the nature reserve that is not open to the public.